It is coming to that time of year where the lakes that produce this deep grass will be showing their full potential. Grass comes and goes here in Texas with water fluctuation and the degree of the severity of our Winter months. We had one of the mildest Winters this year and the water levels are stable. I am expecting to see our grass lakes producing those deep contour runs of Hydrilla. Big bass love that deep grass. It takes clear water for light penetration and a past history of grass. Lakes like Amistad, Rayburn and Toledo Bend are just three that come to mind with such a history. If you are planning a trip for a few days and want to experience something different then begin your research. It will be the most fun trip you will ever take. Keep in mind that there are some small jewels of a lake out there; so make some calls to fisherman that are in the know to pick one that will fit your schedule and travel time. The starting point is always structure related and on contour. You have to have an irregular feature to meet your grass, and that's where the bass are going to be. For bass to be congregated it is a big PLUS to have a point or a creek channel bend. There has to be something different. There will be miles of vegetation that looks the same, but you need to find the little key spots like depth changes or drops. - A cut, point, pocket or other irregular feature along the edge of a well-defined grass line. - Channels and ditches that have grass growing right down the middle. The next ones you go to may only have it growing on the sides of these structures as sediment in them just does not support the growth. - Look for vegetation beneath the surface. If you are seeing matted grass on the surface it may not have the depth needed or the structure to hold big fish. - Look for spots void of growth, with small breaks in the grass bed run. This is an indication of larger hard rock that produces pods of grass which huge Bass love. - Points grow a distinctive Horseshoe shape in the grass line out and around bottom contour. - Funnels formed by the bare bottoms of creek channels or other depressions where submerged hydrilla or milfoil actually hanging over the edge of the ditch bank forming a canape. - A creek or river channel making a bend against the grass, which is the ultimate combination of cover and structure. - Get next to the deepest water you can find with this deep grass on top. It is a challenge because you have to rely on your electronics a lot more to find the points and pockets that have the deep grass beds. When you find that one special spot, just a small grass bed in deep water can hold some big fish. Stay glued to the contour map so you can turn into these small depressions that only have one or two feet of irregular depression which produces that notch in the grass line. It is not always clearly defined on your depth finder. Straight lines where the grass stops are the easiest to find and follow. This is not always the best spot, what you're looking for is that irregular edge, where the grass is thinner and not a solid wall. The Bass seem to stage there better where it is scattered and broken. You will find those smaller clumps producing as they come out to feed in the open areas between the thickest grass. This will help you get that huge fish you have been looking for. Nothing will beat it. It works everywhere, even in shallow mat but best on the deepest grass you can find. They will be grouped up under the hollow. If the wind is blowing you can get in there on the upwind side; put the trolling motor up and big motor up and walk the boat across the mat by rocking the boat from side to side letting the wind drift you across. In the heat of the day they are burred up in the grass. 5.0 heavy super line hook. Tied on 50# braid. Use a Palomar knot. Leave the tag end at 5 inches long. Tie a 1 oz. weight to the tag end. I just tie a knot in the end of the tag, then use an overhand slip knot to attach the weight. It doesn't take much to keep it on. When I am fishing grass with hardwoods and it gets hung on the wood I can pull the weight off and come out with the hook and fish. 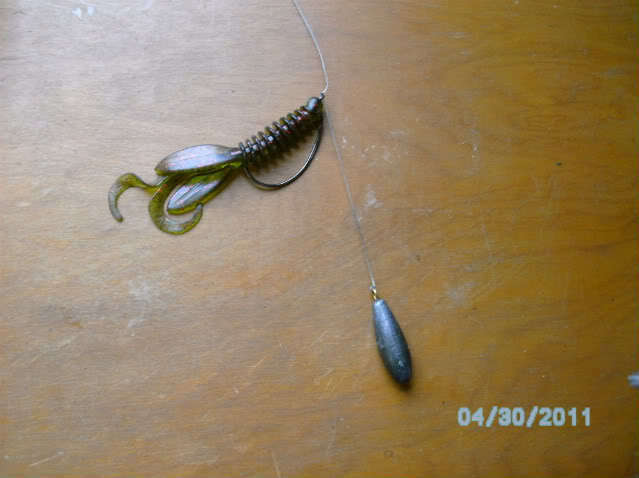 The hook is about 4 to 5 inches above the weight, so the tails of the bait will hang down and cover the weight. Use a Gene Lawrue Hoo Daddy Jr. in Watermelon Neon. This is not Watermelon/Red although they look almost the same; but it makes a great difference. It will drop in the grass and come out of the grass with no hang-ups. Fish vertical to slightly in front of the boat. Directly over the bait is best on the deepest grass. Drop it in slowly and soft so it is traveling slowly when it touches the bottom. The Bass hate anything sneaking in on them. Hold it there with a tight line for about 5 seconds without any movement. They don't want it bouncing up and down. This gives them time to swim through the hollow under the grass and nail the bait. Fish a vertical presentation and moving along the outer edge of the grass line, making pitches out in front of the boat so by the time it gets to the bottom you are directly over the bait for the hook set.